I recently went to a Dartmouth event, and from an older alumnus, I learned a trick to answer this question. In order to find out what you care about, look at where you spend your time and where you spend your money. Period. Time and money don't lie. In my opinion, time and money are arguably the two most valuable resources that are also measurable in our society. Time is fair. It's a great equalizer for us all, no matter your background. 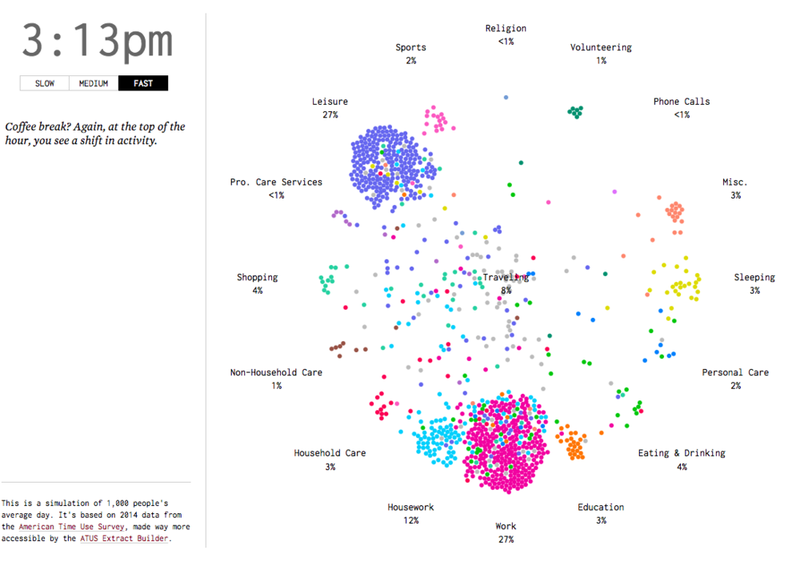 There is a really great visualization that breaks down how Americans spend time (click here for the full visualization). In short, most of us spend our time on three things: sleeping, working and leisure. Work: Most of us spend 8+ hours/day at work. Well, most of us work not out of pure joy, but out of necessity. If you think otherwise, just ask yourself, would you continue to work if you stop receiving a salary? That's what I thought. Hopefully you enjoy what you do at least most of the time, because that's a large part of our lives. Sleep: Most of us spend 6-8 hours/day sleeping. It is non-negotiable beyond that, as it provides the fuel we need for the rest of the 16-18 hours. Leisure: This is the key. Look deeply into how you spend your free time. Here are some common ones. It really tells you what you care about. Eating Out: If you spend a lot of time eating out with friends, you probably value quality time and good food. Outdoor Activities: If you spend a lot of time hiking, traveling, working out, you probably really enjoy nature. Personal Projects: If you have a personal project you consistently dedicate time to, then you are the rare specimen because you probably have a personal passion. Just like time, money also doesn't lie. You may say you care about saving for a new bike, but instead spend money on eating out, what does that say about you? Actions speak louder than words. Mint.com (not sponsored): I highly recommend signing up for Mint, because it tracks and categorizes your spending. It is a very visual way to inform yourself about what you truly care about. If you don't like what it tells you, you can either leave it or better yet, change it! Fixed Spending: If you don't know what I mean by fixed or discretionary spending, check out episode 10 on how I budget for a quick refresher. Specifically, look at how much you spend on housing, as it is most people's largest expense. Do you spend more than 30% of your after-tax income on rent/mortgage? If you do, your action says you really care about housing. Discretionary Spending: There are a lot of different things here. Three most common sub-categories are food/drinks, clothing/personal care, and entertainment, which could be concerts, movies, personal subscriptions. If you find a mismatch between how you spend your money and what you think you care about, then you have to prioritize and make a tradeoff to focus on what you truly care about.